Seventeen years ago today, I found out that an article that I had worked on with my dear friend Marc had been published by Black Issues in Higher Education. It wasn’t the typical process in which an editor or an editorial assistant contacts you to let you know that your piece has made the cut. 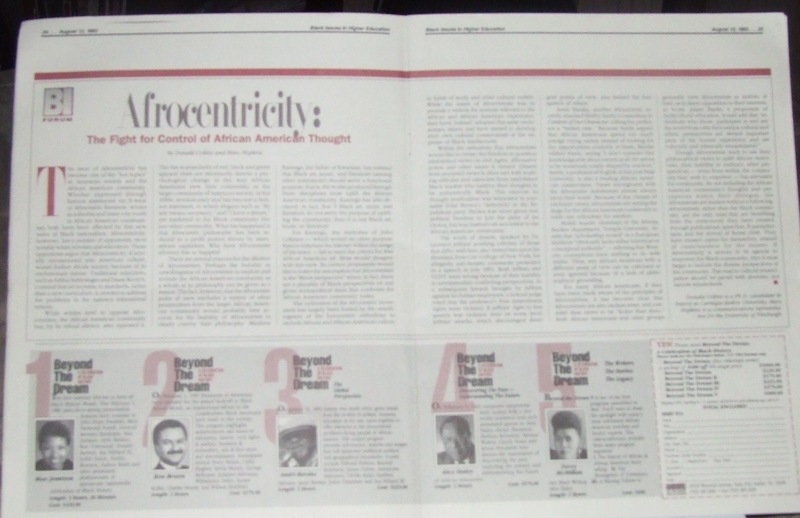 No, I found out from Marc, who found out from a librarian at Hillman Library at Pitt, that our 1,200-word “Afrocentricity: The Fight for Control of African American Thought” was already published by Black Issues as their central Forum article for their August 12, ’93 issue. We did so many things incorrectly in getting that article published. But in the end, it meant renewing a struggle for a sense of my own purpose in life. At twenty-three years old, I was half my lifetime removed from seeing myself as a writer, and had spent most of the previous eleven years denying that any such yearnings remained in my mind and heart. It was an article borne out of Marc’s desire to have an impact on a ridiculous debate over what is and isn’t authentically “Black” or “African” and my need for a few extra dollars. Unfortunately, authentic Blackness – along with my need for increased income – remains after so many years. We worked for two weekends in May on this short critique of Black Studies greats such as Maulana Karenga, Molefi Asante and the latter’s cult of Afrocentric followers, including those who would claim that such things as jazz aren’t authentically Black. After we finished the draft, I left it to Marc to compile the contact information for editors and periodicals. I was too busy looking for work and making sure that I wasn’t evicted from my firetrap of an apartment in East Liberty to put much more work beyond the piece into getting it published. Other than Marc occasionally calling me to let me know that he’d been in contact with Harper’s or had mailed the article to Emerge, I didn’t give the piece much thought until that day in August seventeen years ago. Since our piece was already published, it meant that we’d have to fight to get paid. Based on the number of words, they owed us about $100 a piece. We’d never even received an acknowledgment letter, much less an acceptance or rejection follow-up. In all, Marc contacted some seventeen different magazines about “Afrocentricity,” probably too many to keep up with and police, especially in the case of Black Issues. We learned later that one of the editors hoped to use our article as a straw man for Molefi Asante and his students/followers to burn in effigy, with one letter after another describing us as “Uncle Toms,” “inauthentic,” and “misguided Negroes.” We were virtually everything except children of God. This went on for two months’ worth of Black Issues issues. I wanted to write a rebuttal letter, one that would at least stick it to our melanin-worshipping, authentically-seasoned-fried-chicken-eating, Afrocentric brothas and sistas. My description, not Marc’s. But Marc refused to partake in a follow-up. “We were just trying to help,” he said more than once, as if we were the 300 Spartans at Thermopylae, about to be killed off by an ignorant swarm. I learned quite a bit from those days of naiveté. One, that as a writer, that it was just as important for me to be involved in the selling of our article as it was for me to do the actual writing. Two, that mass mailings of articles for publication only work if you don’t care about making money or about how you as a writer are treated. Three, that I as a writer must stand by my work, especially when I know I’m in the right. And four, that even in the midst of my climb into all things PhD, that I was and would always remain a writer. This experience would serve to help me figure out how much of a writer I could and should be as my time pursuing an academic career came and passed.